The Cloud is hot news – but why? Cloud services are hot, that’s hardly any news. It is to the cloud most people move, but the journey to get there may be more or less smooth. Do you think it is getting too expensive and unnecessarily difficult to maintain your hardware by yourself? Is it becoming difficult staying as agile and flexible as the world around you demands? Then it may be time to plan and execute your cloud strategy. The possibilities of the cloud are endless and in order to create a smooth and smart cloud journey, you need to start weighing up the challenges as well as the possibilities that you want to achieve from using the cloud services in your organization. Today’s competition is intense and unyielding. To stay competitive and trustworthy as a partner, you need to constantly develop your offerings and dare to be at the forefront - all the time. Are you looking for options that are cost effective and scalable? You are far from alone, but this is where the cloud can actually make a difference. Scalability, flexibility and cost effectiveness are some of the most obvious benefits of cloud services. 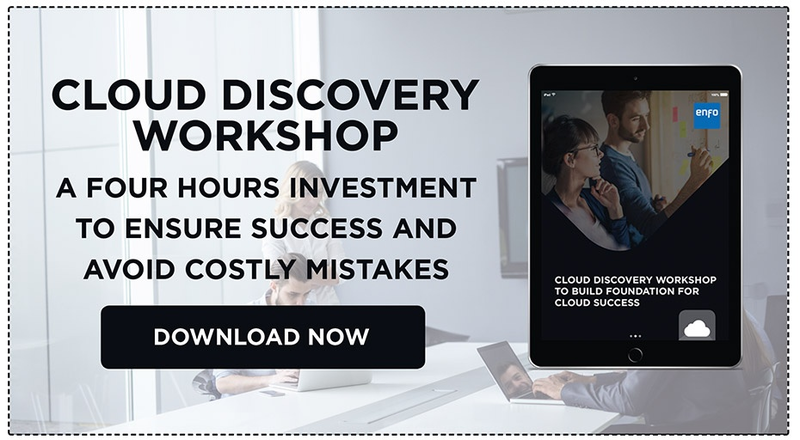 To quickly scale up or down when the demand for your products and services varies, not needing to have capacity in stock for your peaks, and being able to quickly develop environments in which to test new ideas or markets – that’s the very idea of consuming cloud services. However, in order to maximize these benefits, you must dare to free yourself from old solutions, infrastructure and expensive management. These parameters only limit your development. Instead, see the options in the cloud as an excellent way to free up time and capital. In order to act at the rate that your world demands, you need to increase your innovation rate. You need your IT as an enabler instead of a bottleneck. If you succeed, your business will increase. If you have decided to go cloud properly or develop and extend your cloud services it is important to have a clear plan and a well-founded business case as a starting point. A documented case that sets expectations at the right level. Making your investment in cloud services successful requires goal awareness and patience. So, start with the simple things and focus on achieving benefits, learn from them and continue forward in the same way. What does cloud services mean? The cloud is awesome in a whole lot of ways! This is where we want to be – both now and in the future – and concepts such as IaaS (Infrastructure as a Service), PaaS (Platform as a Service) and SaaS (Software as a Service) have a clear spot in our modern IT dictionary. However, before we narrow down these concepts, it is good to establish a common ground. What do we mean by these different concepts? Measurability, that is, you pay for what you actually use. When we talk about cloud services, there are three different models and it is usually a mix of these that makes it interesting. Either you rent the software (SaaS) and pay only for use. Or, you can rent the entire platform (PaaS). An example of a PaaS service is Office 365 where you rent the entire platform. In this particular case, the software includes Word, Excel and PowerPoint. This then becomes a mix of PaaS and SaaS. Finally, we have infrastructure, IaaS, as a service. Here you rent the hardware – that is, the infrastructure such as network, servers to process the information and storage for your data. IaaS is simply about purchasing capacity in the cloud from a supplier. You utilise it as a subscription service instead of carrying costs for the hardware, as well as management and development of your own data centre. Therefore, it becomes an “on-demand” service that provides significant financial benefits as well as flexibility and agility. You do not need to tie up masses of capital or invest in new hardware if your business changes – you simply rent more capacity. Best of all, you have access to the capacity when you need it, nso the downtime can be significantly reduced by a good IaaS service. Private or public cloud – what’s the difference? The biggest difference between the various cloud services is the level of control that you have or want to have, as a cloud service customer. How much control do you want over your hardware, storage, development and management? Can you share a server with other companies or do you have statutory requirements that makes it impossible for you to release control to an external provider? Whatever your needs, there are cloud services to suit everyone, but it’s important to consider these parameters before the journey begins. Otherwise it could turn out to be an unnecessarily bumpy ride. Cloud services can be implemented in different ways based on your needs. If you can imagine sharing the cloud with other organizations, you can rent space in a so-called “public cloud”. If you want to have your own earmarked cloud, then it’s a “private cloud” you should be aiming for. The price picture is obviously higher for private clouds, so perhaps a hybrid somewhere in between would be the best solution for you. Everything is conceivable in the cloud!